Kick off the holidays in San Diego this upcoming weekend enjoying everything California’s Beach City has to offer including these top things to do. The second-annual “Battle on the Midway” Collegiate wrestling showcase, presented by Left Coast Wrestling, will feature a pre-Thanksgiving interstate showdown on the flight deck of the famed aircraft carrier USS Midway when the Fresno State Bulldogs square off against the Stanford Cardinal. Slide into the season at San Diego’s exclusive waterfront holiday adventure park – Holiday by the Bay! Hilton San Diego Bayfront’s newly re-imagined holiday tradition features Reindeer Run, an exhilarating two-story 100-foot ice tubing slide; the Iceberg Bumpers ride; plus Shine, an hourly interactive dynamic light show. Celebrate the season with stocking decorating at Santa’s Workshop, cookie decorating at Claus Kitchen, and festive craft cocktail flights at Yule Lodge. Gather the family for sweet and savory treats from Elven Eatery and Kringle Bakery or sip cocoa and toast s’mores at a private Fireside Lounge. Skating by the Sea returns to Hotel del Coronado for the 14th year. 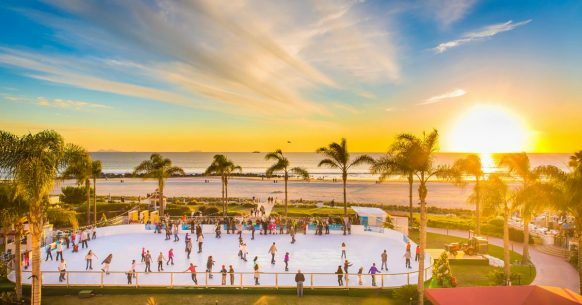 This spectacular ice rink is located seaside on Windsor Lawn and features stunning views of the Pacific and Coronado beach. The Del’s iconic Victorian Building, adorned with thousands of white lights, provides a magical backdrop as holiday music fills the air and guests enjoy hot chocolate and libations. The Del’s Skating by the Sea partially benefits the Wish Kids served by Make-A-Wish San Diego. Thanksgiving is a beautiful time of year in San Diego, marking the official start of the holiday season. Typically boasting glorious weather, with a distinct touch of fall, from the coast to the inland valleys you’re able to enjoy SoCal’s outdoor lifestyle including days at the beach, shopping at outdoor malls, and nights out at rooftop bars. Enjoy a traditional Thanksgiving feast, burn some extra calories in a turkey trot, catch a pro football game, or volunteer your time for a worthwhile cause. However you choose to spend Thanksgiving, spend it giving thanks in San Diego! ‘Tis the start of the season and the Gaslamp Quarter is bringing you all types of jolly with an extravaganza of festivities for all ages to enjoy on Saturday, November 24th on Fifth Avenue between Market & J Street! Embrace the holiday spirit in the historic heart of San Diego with 80 holiday vendors, meet n greet with Santa, a special lighting ceremony, and more! Surfin’ Santa will ditch his red suit and reindeer to spread his holiday cheer in true SoCal fashion as he makes his annual arrival at Seaport Village.